Go inside the latest Eskimo Dance as the party tours the U.K. with Wiley, Skepta, Kano, and more. Mike Skinner recruits Jammer for new single with Tonga collective "Makes No Scene"
Boy Better Know MC and producer Jammer tells the history of his legendary grime clash series Lord of the Mics in his own words. Skepta, Jammer, Shorty, Logan Sama, Sian Anderson, Stormzy and more choose their favorite lyrics from JME's third album Integrity. After Kanye’s bold co-sign of some of grime’s biggest stars, get to know Skepta, Jammer, Novelist and more. From best dressed to best guests, here’s who we’d be handing out trophies and wooden spoons to if we were left in charge. This week was big and meaningful. 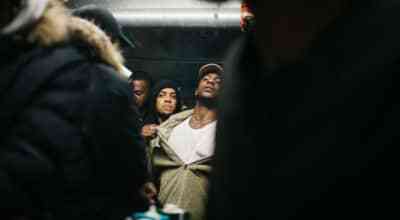 Grime’s stars go transatlantic, dropping bars over a set spanning the genre’s history.